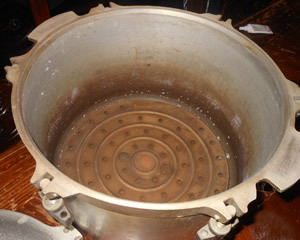 Click here for the parts to convert the older All American Canner petcock assembly. Genuine All American Pressure Canner Replacement Covers for all models of the All American Pressure Canner. We offer the covers in two versions: No Parts and With Parts. Genuine All American Pressure Canner Replacement Bottoms for all models of the All American Pressure Canner. We offer the bottoms in two versions: No Parts and With Parts. This Vintage All American 921 Canner (pictured below) features a petcock and was made by Wisconsion Alumimum. The petcock is no longer manufactured. These photos were submitted by August, 2014. You can exchange the toggle switch with the new vent tube and regulator and it will work just like the new ones. We recommend however that you purchase the instruction booklet because they work a little differently. 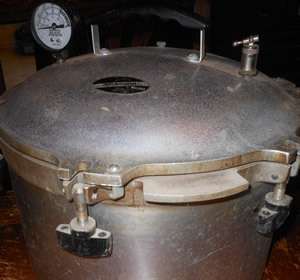 Michelle Larson from Waterloo, Iowa sent us these vintage All American Pressure Canner No. 7 photos that her mother used for many years. She sent it to Larson about 15-20 years ago to use for her family. It travelled from Grand Island, Nebraska to Nampa, Idaho and finally to Waterloo, Iowa where Larson's family uses it every couple years. It is missing the original gasket but otherwise it's all-original. It's a bit stained from years of use and a little dusty from setting on the shelf so we gotta do some clean-up, get a new gasket, and do the annual maintenance on it but it still works! Tip & Advice: "Take good care of the parts. Preserving what you have is MUCH cheaper & easier than trying to find discontinued parts years later. Trust me, I know! LOL" The most important reasons she preserves her own food, "are the fact that I KNOW what's in the foods I feed my family and I save a bundle at the grocery store." "We're happy to share this wonderful piece of working history with others," Larson said. <<There's even a vintage instruction manual! The newst instruction manual can be purchased above and is still safe to use with these vintage cookers.